As the dates draw nears to celebrate the 75th birthday of Pensacola Dam (August 7 and 8), it seems like a good time to again share some of the history of the project and how it came to be. Of course, volumes have been written about the dam since it first went to work for Oklahoma in 1940, but there are still plenty of interesting facts and figures that most of the public has never heard. The entire construction project was comprised of roughly 60 different contracts. They ranged from contracts for excavation of the dam site, to contracts for clearing timber from the area that would become Grand Lake. President Franklin Roosevelt approved the allocation of $20 million in September 1937 for the Pensacola Project. Two days later, the GRDA Board traveled to Austin, Texas to visit the Buchanan Dam, another multi-arch dam already under construction by the Public Works Administration. One key event that helped ramp up construction was the completion of a bridge across the Grand River, just south of the dam site. It was important because it allowed workers and equipment an easier path to the site. The bridge was completed September 12, 1938 and “from that day, the road and bridge were in constant use” wrote W.R. Holway, GRDA’s consulting engineer for the dam’s construction. Rock for the concrete plant at the construction site was delivered via railcar from the Whitebird Quarry, located 21 miles from the dam site. This specific rock was chosen because “it contained excellent limestone” wrote Holway. GRDA will celebrate even more Pensacola Dam history, and honor the memory of those who helped make the dam a reality, during the special 75th birthday party for Pensacola Dam on Friday, August 7. The event will be held at the GRDA Ecosystems and Education Center in Langley, beginning at 7PM. The public is invited. Up and away … Pensacola Dam’s iconic arches were in the early stages of construction when this photo was taken in July 1938 (looking west from near arch #40). The site was still a mass of rebar, wood forms and concrete, but the magnificent structure was beginning to take shape. 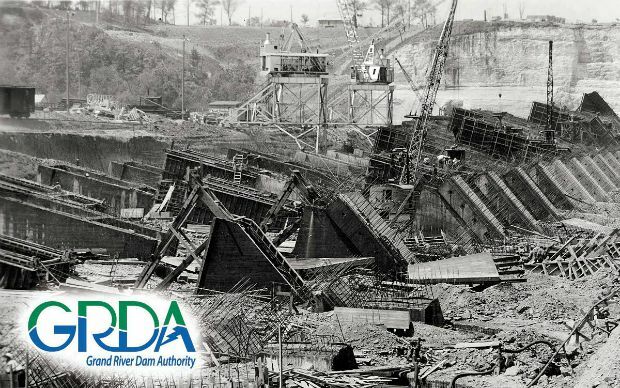 GRDA will celebrate the dam’s first 75 years during a special ceremony on August 7. The public is invited.